iChat, Apple's bundled instant messenger app that evolved from origins as an AIM chat client to being a video-enabled IM client supporting the open XMPP/Jabber protocol, now adds support for a third IM protocol: Yahoo IM. Unlike email, which all providers support via common standards, IM has long been partitioned into proprietary solos, with AOL, ICQ, Skype, Yahoo and Microsoft MSN/Live Messenger all using their own closed systems for text and video chat (Apple's .Mac/MobileMe service uses AOL's IM server, and AOL provides an SMS gateway that enables iChat users to send SMS messages to mobile numbers). Yahoo and Microsoft announced a chat-only gateway between their services, as did AOL and ICQ (AOL until recently owned ICQ). In other cases however, anyone who wants to exchange messages with users on different systems must use a multiprotocol chat client and create separate accounts for each service. Alternatively, you can configure your own gateway server or use an external gateway that logs into your account on another service to schlepp IM messages between the incompatible account types. 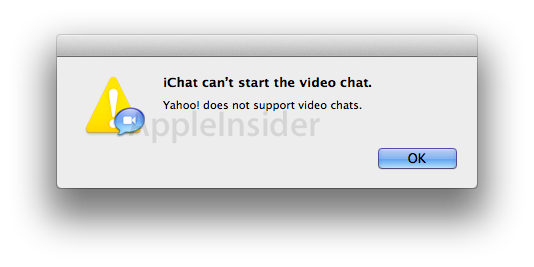 Mac OS X Lion's iChat 6 now adds support Yahoo IM, although the service appears to only support text chats, not Yahoo audio or video chats. Because of the chat gateway between Yahoo and MSN, this should enable iChat users to reach both populations of chat accounts, in addition to existing support for Jabber/Gmail IM and video chat and AOL/ICQ/MobileMe IM and video chat. However, while the Lion iChat client does work with Yahoo accounts, the gateway between the Yahoo and MSN does not actually seem to work. 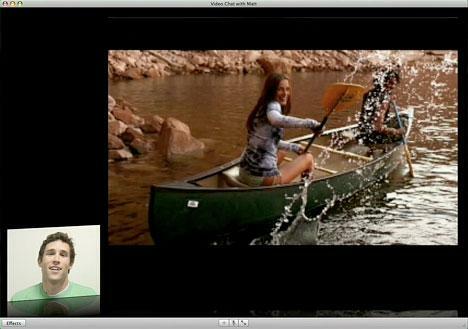 Starting with iChat AV in 2003, Apple added support for SIP, standards based video chat. The next year, AOL added compatible video chat in its AOL IM client for Windows, allowing Mac and Windows users to video chat using the AIM network. 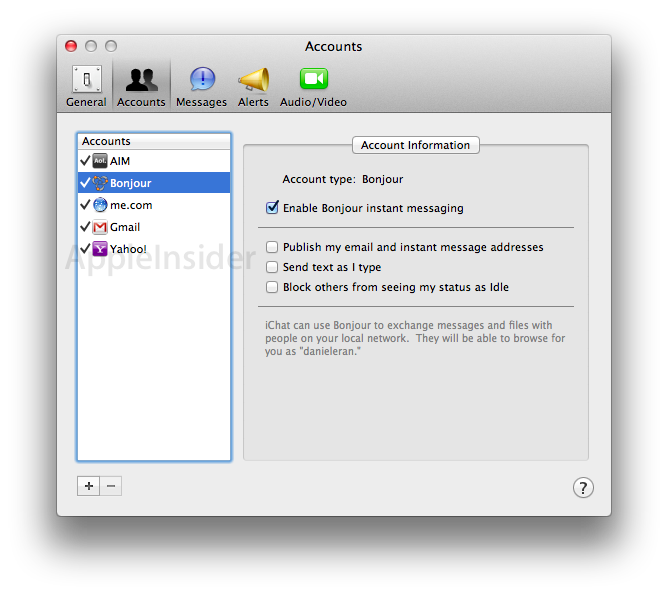 Alongside the release of Mac OS X 10.4 Tiger, Apple shipped a new version of iChat with support for the open XMPP (Extensible Messaging and Presence Protocol, originally named Jabber), enabling iChat to work with both AIM and open clients including Apple's own iChat Server in Mac OS X Server and later, Google's GTalk service. iChat's Bonjour chat among local users on the same network also uses XMPP. In Mac OS X 10.5 Leopard, Apple integrated support for VNC screen sharing, allowing users to share their desktop remotely as a video chat over either the XMPP or AIM protocols. Apple also released iChat Theater, which could share a photo, video, or any document supported by Quick Look over a video chat (below). Third party support for tapping into these features was also added to a new Instant Message framework.